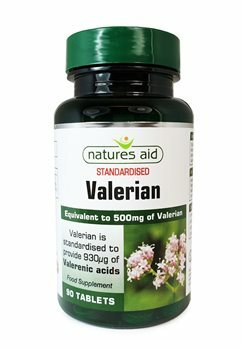 Natures Aid Valerian is standardised to provide 930ug of valerenic acids. standardised to provide 930ug valerenic acids. Di-Calcium Phosphate, Microcrystalline Cellulose, Valerian Root Extract, Tablet Coating (Hydroxpropylmethylcellulose, Glycerine, Lecithin, Dextrose), Anticaking Agents (Silicon Dioxide, Vegetable Source Magnesium Stearate). Take 1 - 3 tablets per day with food.